Oboes making squeaky noises is usually outside my comfort zone, but I did enjoy this thought-provoking album of music. 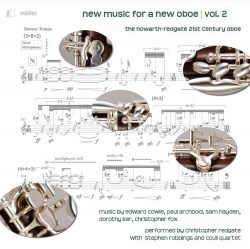 The title of this new CD refers to the fact that all this music is played on the newly created Howarth-Redgate (or is it the Redgate-Howarth) oboe as well as the recently-devised lupophon which is a bass incarnation of the instrument. Christopher Redgate is an indefatigable performer of contemporary oboe works. His CD catalogue includes music by Edwin Roxburgh, Michael Finnissy, Rob Keeley and Howard Skempton. In concerts, Redgate often performs improvisations which has allowed him to “explore the more extreme areas of the oboe and its potential”. His vast appreciation and understanding of avant-garde techniques has led him to develop this new instrument. Detailed information about Redgate’s new oboe can be found at his website. The works on this CD have been composed/created through collaboration between Redgate and the composers. Many of them use the extended range that this instrument provides, as well as possibilities of microtonal and multiphonic sounds. Other innovations include ease of playing, very high notes and sounding the oboe without the reed. As a definition, ‘multiphonic’ means playing multiple notes on an instrument designed to play only single notes – flute, oboe, trumpet, human voice etc. I understand one of the earliest examples of this technique was called for by Luciano Berio in his Sequenza 1 for solo flute, written in 1958. ‘Microtonal’, means the further subdivision of the scale into intervals smaller than the semitone: there is a quarter-tone scale available throughout this oboe’s range. I would suggest plunging into this CD with Paul Archbold’s Zechstein. I wondered if this was a make of German piano: I was wrong. The composer explains that it refers to the Zechstein Sea which was a large lagoon in the centre of the ancient Pangea super-continent, with its waves lapping against the shores of what is now County Durham. The water dried up and the tectonic plates separated, slowly evolving into the land masses we recognise today. It was a wee while ago, round about 250 million years, in fact. But the concept lives on in the imagination. Zechstein is an idyllic work written for solo oboe that balances a reflective and tranquil mood with a range of sounds made possible by the Howarth-Redgate oboe. It is a timeless work, with the multiphonics adding to the haunting atmosphere of this long-departed landscape feature. The programme notes for Sam Hayden’s surface/tension for oboe and piano does not give an immediate, succinct clue to the nature of the work. Let me give two examples: “In addition, artificial inharmonic spectra and complex rhythmical structures were generated algorithmically by the computer, and then chosen by the composer” and “The spectral analyses of multiphonics unique to the instrument were used to generate microtonal pitch fields” doesn’t really help the average music-lover. I can only assume that this work is designed for cognoscenti only, and not for most music lovers. If I paraphrase, what I think is happening is two-fold. Based on a pre-chosen set of notes and harmonies, the piano and oboe enter dialogue, debating and discussing this material. The music vacillates between fast and slow, virtuosity and stasis. There are certainly some amazing sounds. Full stop. Dorothy Ker’s Clepsydra is based on the Greek ‘water thief.’ Empedocles, the 5th century BC poet and philosopher, developed a theory of respiration by making an analogy with the clepsydra, which was an ancient mechanical device used to carry water. Carl Sagan has defined it as “... a brazen sphere with an open neck and small holes in the bottom, it is filled by immersing it in water. If you pull it out with the neck uncovered, the water pours out of the holes, making a small shower. But if you pull it out properly, with the neck covered, the water is retained in the sphere until you lift your thumb”. Ker writes that the Greek’s theory “resonated with the emerging notion of the oboe as an instrument for the crafting of timbre by fine control of its ‘porosity’ (through the multitude of new key combinations available), combined with the oboist’s virtuosity in controlling the column of air to coax exquisite tones from the sweet-sounding cocobolo wood. The material and journey of the piece are informed by this image and related ideas of aggregation and transformation in fluid motion”. I found the verbosity of the philosophical underpinning of this piece as wee bit hard to engage with. However, as a piece of music it is agreeable, with some fascinating noises emerging from the oboe. The longest work on this CD is Edward Cowie’s The Colours of Dark Light (2013). This is written for oboe, cor anglais and lupophon (all played by Redgate) and the Coull [String] Quartet. The work is inspired by physics, and has been written in ‘collaboration’ with Sir Michael Berry FRS. Clearly, acoustics is a branch of physics. Cowie writes that “time and energy…are the fusion-models for the interplay between the two disciplines”. The music explores a concept known as “the colours of dark light” or “the heart of darkness”. Again, the liner notes stretch the understanding of the layman – what exactly does “a movement about time-order-chaos-randomness and forms of thinking which converge towards solutions through often troublesome and unpredictable ways of forming and acting in matter and energy” mean? The titles of the four movements are: 1. Michel Berry: Sonic Portrait, 2. Random Ph(r)ases, 3. Tracking a Phase Singularity and 4. The Colours of Dark Light. The opening movement is a “sonic portrait of the scientist himself”. The final three make a journey from chaos to order. But just how much order is a question that begs to be answered. Finally, I passed Higher [A] level Physics at Coatbridge High School - but I do not ken what ‘Phase Singularity’ is. Wikipedia tells me that it is ‘An optical vortex (also known as a photonic quantum vortex, screw dislocation or phase singularity) is a zero of an optical field; a point of zero intensity.’ Hmmm. By dumping the programme, I thoroughly enjoyed this music. In fact, it is my favourite work on this challenging disc. I did have to check my sound system whilst playing Christopher Fox’s Unlocking the Grid (2015). There were times when I thought it had stopped playing. This work, which is written for solo woodwind and an electronic accompaniment derived from three overlain sound channels, was specially written to showcase the new oboe. The inspiration for this work was the artwork of Agnes Martin, and, as the composer says, is “in part a homage to her”. To my untrained eye Martin’s work seems a little lacking in interest often consisting of what looks like squared paper, like that used at primary school. It could be said that the slow-paced exposition of Fox’s piece is equally devoid of attention-seeking attributes. Yet the mood of almost complete stasis which lasts for 16 minutes-plus is an achievement. Unlocking the Grid did bore me, a little: it was certainly a long and tedious quarter of an hour. The CD booklet is a masterclass in design. From the interesting cover, through the programme notes for each work and the composer and artist biographies, it gives all the required information. There are several photographs of all concerned, as well as a picture of a standard Howarth oboe next to a Howarth-Redgate instrument for comparison. I must confess that, not being a woodwind player, it does not tell me too much, but I am sure it will be of interest to those musicians who are. I have noted the sometimes-unfathomable programme notes above. My suggestion is to enjoy the music, one piece at a time and largely ignore the highfalutin’ musico-philosophical speculation. The recording impressed me, as did the performances, which clearly appear to be first-rate, even if I have nothing to compare them with.